The bony pelvis and its enveloping soft tissues are a common site for bone and soft-tissue tumors. Extensive pelvic surgeries, either for oncologic reasons or following trauma, are highly demanding because of the irregular and complex shape of the bony pelvis, numerous muscle attachments, and the proximity of major blood vessels, nerves, and visceral organs (Figure 10.1). Until the late 1970s most pelvic tumors were treated with hemipelvectomy, a procedure that was associated with a significant percentage of complications and a dismal functional and psychological outcome. 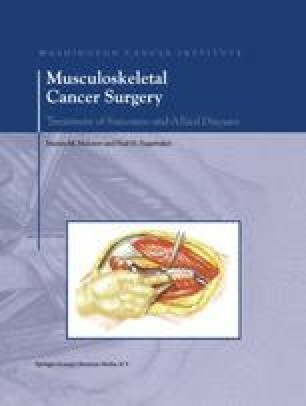 Because of the availability of more accurate modalities for imaging of the pelvis, use of neoadjuvant chemotherapy, improved resection techniques, and prosthetic reconstruction, limb-sparing procedures are now performed in the majority of these cases. An important consideration, because of the use of adjuvant chemotherapy and, occasionally, radiation therapy, is that the patient’s postoperative recovery period be short and uncomplicated. This chapter discusses specific anatomic and clinical considerations, related to surgery in the pelvic area, as well as the various classifications of pelvic resections.